The major thrust of Dr. Cerullo’s ministry changed in 1962 when God granted his prayer to pass on the anointing God had placed on his live to others. He immediately began training nationals. First one on one and then in small groups and then to thousands in Schools of Ministry. The purpose was to Build God an Army to build and Strengthen the Church. Beginning in 1970 and continuing for fourteen consecutive years, Morris prophesied that the Iron Curtain would come down. He stood in the Royal Albert Hall in Great Britain, before approximately 7,000 people, and prophesied that all of Russia would open and the Berlin Wall would come down. On November 9, 1989, the Berlin Wall, separating East and West Germany for more than thirty years, was demolished. This led to the reunification of Germany on July 1, 1990. From November 1991 until April 1992, eighteen new nations were established. The door for evangelism throughout Russia and Europe swung wide open! At this strategic point in 1990, as Russia was opening to the Gospel, God sent Cerullo to Moscow, Russia, where 10,000 people packed into the Izmyloski Sports Hall for the first public healing and evangelistic Miracle Crusade. This was the first crusade conducted in Moscow since the Bolshevik Revolution. Thousands of Russians were saved. Doors were opened for him to go on primetime television where he led a potential 20,000,000 viewers in the Sinner’s Prayer and prayed for the sick. In 1986, during the revolution in the Philippines, God sent Morris to Manila with a prophetic word to strengthen the church throughout the nation during a time of crisis. He trained more than 4,000 Nationals in a School of Ministry. God spoke to Morris early in 1998 to prepare to go to Indonesia to conduct a seminar and crusade. 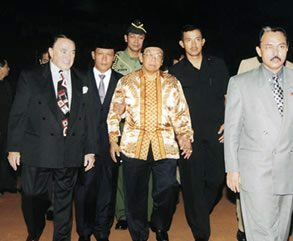 From April 30 to May 1, 1998, he conducted meetings in Surabaya and Jakarta. In Surabaya, the auditorium was packed with 7,000 believers with 5,000 standing outside. In Jakarta, 12,000 packed the auditorium with 10,000 unable to get inside. Within a couple of weeks of that meeting Indonesia experienced economic and political disaster. Banks collapsed. Houses were stripped and burned, women were raped. Protests and riots erupted over government corruption and price increases. The situation escalated to total anarchy on May 14 with more than 200 people having been killed. God sent Morris ahead with a prophetic word to prepare the people for what was coming. God has used Dr. Cerullo with routine regularity to go into nations before a natural disaster hits, political change is about to take place or economic crisis is on the horizon to Strengthen the Church and to train nationals to encourage and build up the Church. Dr. Morris Cerullo, President of Morris Cerullo World Evangelism, is a man with a heart that beats for reaching souls. In more than 61 years of ministry, most of his time has been spent in worldwide evangelism, going to the nations preaching and teaching a powerful, un-compromised message of salvation, healing and deliverance. Thousands of Nationals and literally millions of people around the world have acknowledged Morris Cerullo as one of the leading apostles and prophets of the 20th century, now going into the 21st century.